Geneva. It’s a wealthy, safe and pretty place that is, at times, surprisingly left-leaning especially when it comes to issues such as freedom of speech. 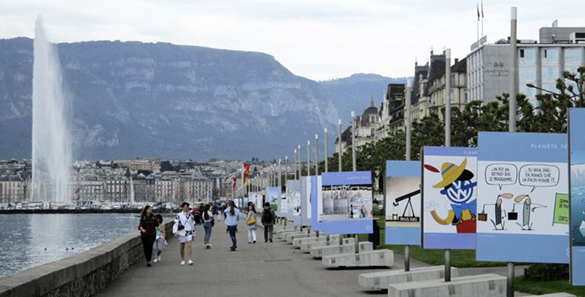 Every year, the city sponsors a lakeside exhibition of “Cartoons for Peace” from all over the world. Beautiful? Maybe. Brilliant? Absolutely! One hundred huge panels display the best of cartoons that accuse, taunt, embarrass and blame the powerful, the corrupt and the cruel. The pencil-wielding warriors don’t pull the punches. Those war-mongers must really cringe! However, the exhibition has mission creep. 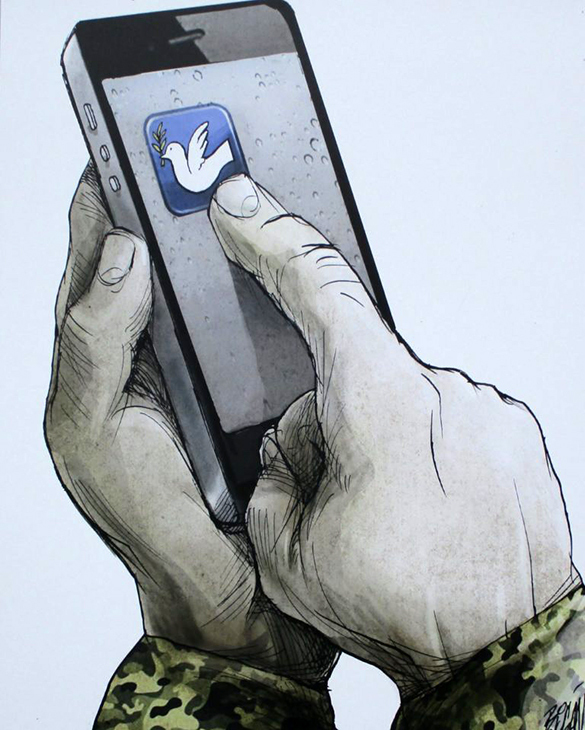 It’s no longer just about peace. Other subjects that reach us daily via global media get a caustic drenching from these observant graphicists. For the viewer, the slick images fire an intriguing alloy of emotions. There is a universal desire for peace. There’s an app for everything now. Hey! You military guys! It really could be that easy!! This makes me feel a kind of pity for humanity. Some people can think up jokes. They have the ability to merge different elements of a narrative into a timely punch-line. I guess a cartoon is a kind of visual joke. A few disparate observations or notions are drawn together into one arresting and complete visual concept. At first glance, a cartoon is simple; but the viewer is invited to examine the image, refine its elements and then “get” the interaction of those elements in a mental join-the-dots exercise. There is then an emotional impact. What fascinates me more is that by “getting” a cartoon about a big global issue, I feel I am actually doing something about it. Ha! Slactivism! 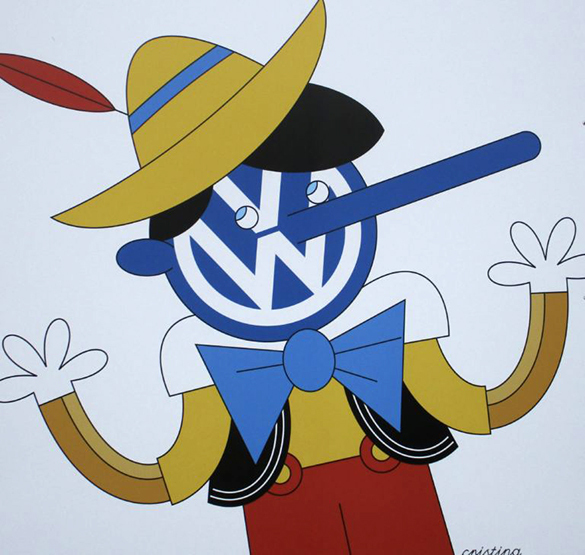 A major car company. Guilty smile. Lies. Children’s toy. Innocence. This amuses me. Superior American military technology. Unthinking citizens. 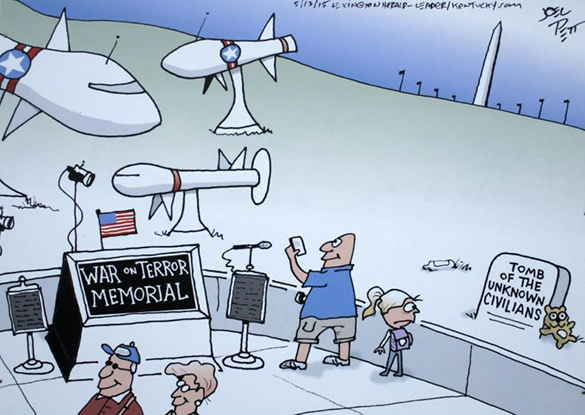 Anonymised “collateral damage” (especially children.) Killing at a distance. Unknown and unseen perpetrator. This makes me very angry. Too close to the bone! Writing not possible although it should be. Erasing is the norm. Censorship. I feel a kind of objective concern. I’ve never lived for any length of time in a country where I cannot say what I think. I admire the simplicity of the image. Sinister anonymity of a man of violence. 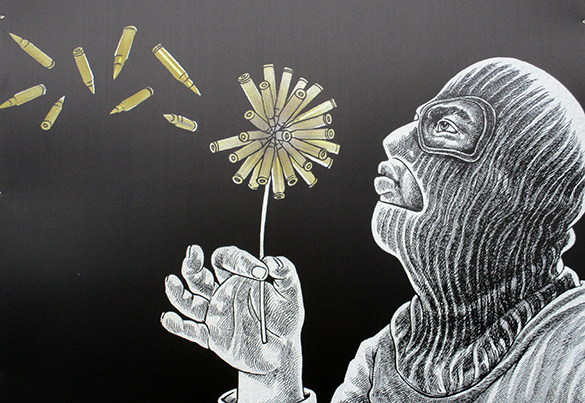 Juxtaposition of delicate flower and ammunition. Making a wish. Wind blowing right to left (east to west?) I am afraid. Migrants from islamic countries. 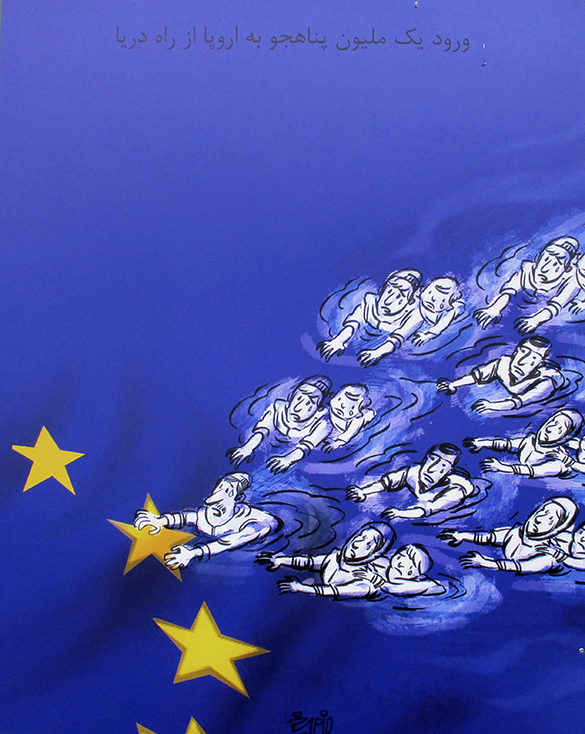 Families about to drown. Only possibility of survival is Europe. I feel sad and enormously lucky to live where I do. I also feel a responsibility but I am not sure what I can do. A compass. Is it worth undertaking the journey? 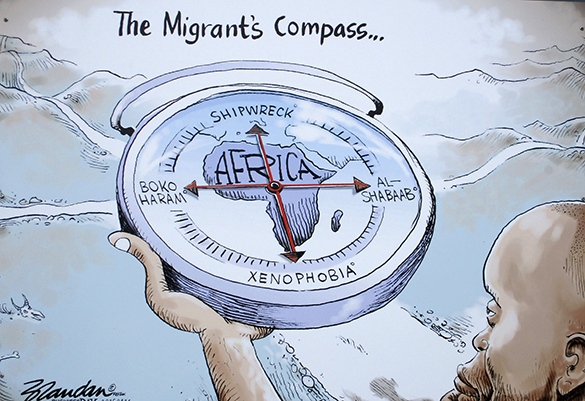 Stark choices for Africans. Desperation. I feel totally helpless. A cartoon may work in our minds like a joke but is not always amusing. 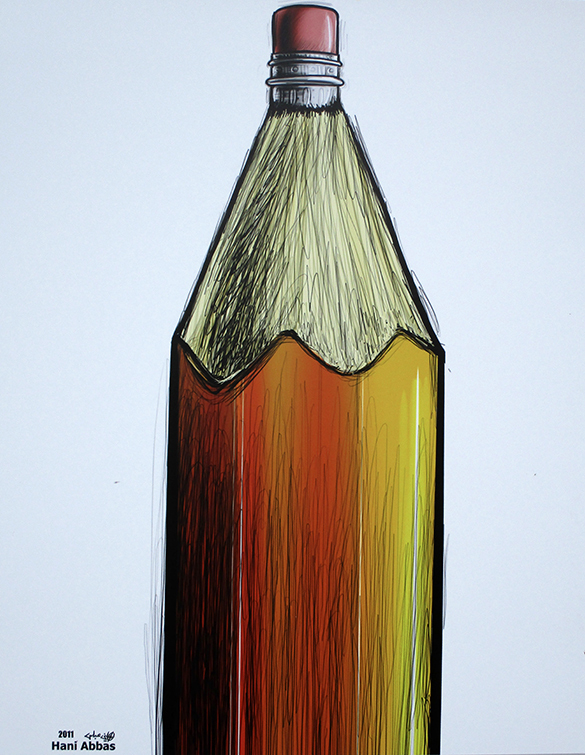 Unlike the verbal equivalent, a cartoon on being propagated can identify its talented creator. Let’s not forget that in many countries, the emotional reaction to these clever drawings might end in a prison sentence or worse for the cartoonist responsible.